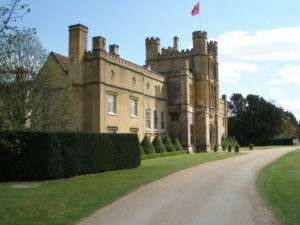 Coughton Court is the home of the Trockmorton Family. They are one of the U.K’s oldest Catholic families and they have lived at Coughton since 1409. It is an imposing Tudor house standing in 25 acres of grounds and with some of the most beautiful gardens in the country. The name Coughton (pronounced “Coat-un”) suggests a settlement or farm known for the hunting of woodcock or game birds. It is believed there was a medieval house on the site when John de Throckmorton arrived in 1409 to marry Eleanor de Spiney. Coughton Court holds a unique place in English history with its close connections to the Gunpowder Plot of 1605 and the Court of Henry VIII. The family were very prominent in Tudor times and were the instigators of the Catholic emancipation. Around the house there are all manner of family mementos and Catholic treasures that have a connection to those dark and challenging times. Secret chambers used as part of the Gunpowder Plot and the double priest’s hole used to hide Catholic clergy in the fallout from the Reformation. It is one of the last remaining Roman Catholic houses in the country to retain its historic treasures; it houses one of the very best collections of portraits and memorabilia of one family from early Tudor times. Alongside the family items on display, there are pieces such as the chemise reputedly worn by Mary Queen of Scots when she was executed and a bishop’s Cope, with intricate needlework, believed to have been worked upon by Catherine of Aragon. Following the eventual introduction of the ‘Catholic Emancipation Act’ the very first Catholic M.P. to sit in the House of Commons was a member of the Throckmorton family from Coughton. The estate suffered badly during the Cival War. The Throckmorton’s supported the Royalist cause, and this resulted in Coughton Court becoming the subject of a Parliamentarian attack. The house was captured and ransacked by Parliamentarian troops, leading to much repair and restoration to be done. Fortunately Coughton Court still has many of its original features including its flamboyant 16th century battlemented Gatehouse Tower. This stands as a dramatic statement of Tudor authority and would have looked even more impressive than it does today reflected in the moat which once surrounded the house. with a 300 year lease of residence. After inheriting the estate in 1992, it was Clare McLaren-Throckmorton’s intention, together with her daughter, the acclaimed garden designer Christina Williams, to create a garden that provides this beautiful house with the setting it deserves. The centrepiece is the famous Walled Garden, with a concentration of roses and herbaceous plants. Other features include the bog garden, the formal lawns, vegetable garden, orchard, soft fruit garden and a lovely walk from the garden alongside the River Arrow. The formal knot garden which is the centrepiece of the half-timbered Courtyard is particularly attractive. Recently a new daffodil garden has been established and devoted to the rare Throckmorton daffodils developed by the late Dr. Tom Throckmorton. There are two Churches at Coughton Court, the Grade 1 listed St. Peter’s Church next to the house, and St. Peter, St. Paul and St. Elizabeth’s Church further down the drive. St. Peter’s Church was built in the late 15th century on a Norman site, by Sir Robert Throckmorton. It began life as a Catholic Church but, following Henry VIII’s Reformation, is now Church of England. Inside the church is the original tomb intended as the final resting place of Sir Robert Throckmorton but he died in 1518 on pilgrimage to the Holy Land and leaving the tomb empty for over 350 years. He left money in his Will for the Depiction of Doom in stained glass in the East window, the Seven Sacraments in the North chapel and the Seven Acts of Mercy in the South chapel. Sections of these windows appear to be scattered amongst the jumbled glass in some of the aisle windows. In 1791 his descendant, another Sir Robert Throckmorton, 4th Baronet, was laid to rest in this tomb. Also inside the church is the tomb which contains Sir George Throckmorton, son of the original Sir Robert, and his wife Katherine Vaux. Images of their 19 children can be seen on the cover of their tomb. Other features in and around the church include the font and in the churchyard there is a cross base with a sundial on a 17th century column. The late 17th century clock, which has no external face, chimes on the hour using one of the three bells cast by Bagleys of Chacombe in 1686. Close by, is the Catholic Church of St. Peter, St.Paul and St. Elizabeth and was commissioned by Sir Robert Throckmorton, 8th Baronet, soon after the ‘Emancipation Acts of 1829’ were passed which permitted the building of non-Anglican places of worship. Designed by the Catholic architect Charles Hansom (brother of J.A. Hansom, inventor of the Hansom Cab), it was erected in 1857 but reflects the church building styles of the 14th century. Some of the stained glass is by John Hardman, an artist who worked with Pugin and was a pioneer of the stained glass revival in the 19th century. Both Churches are still in use. Coughton Village has for over 600 years been historically linked with the Throckmortons, one of the great Catholic families of England. Most of the cottages and houses in the village were sold from the Throckmorton Estate during the 20th century to boost the Coughton Court endowment which funds the conservation and maintenance of the Court buildings and collections. Coughton village is unusual in that a substantial piece of land at its heart has remained undeveloped. It is an area of some 4 acres lying between Coughton Lane and Sambourne Lane. Parts of the village lie within a Conservation Area. The main road (A435) divides the historic village down the middle. Leading from the main road are three lanes that basically form the village; Coughton Fields Lane, Coughton Lane and Sambourne Lane. The centre of the village is considered to be the cross-roads next to the medieval stone cross. Opposite the cross are the former almshouses, the old Post Office and Coughton Cross Farm. The most substantial houses in this area front the old highway dividing the village. Most prominent is the classical villa with sash windows and painted stucco, which is not quite axial with the great avenue centred on Coughton Court across the road. Shielded from the road is a big-boned 16th century timber-framed house, and further north along the road is the former Throckmorton Estate Office, of late timber-framing with brick infill panels. Coughton Fields Lane runs along the south side of Coughton Court following the route of an old packhorse road and crosses the ford through the River Arrow. The 17th century timber-framing at the back of the old Post Office is characteristic of the first part of Coughton Lane, which has former estate cottages on both sides, dating from the middle 19th century, again with brick walls and plain tiled roofs. The pair of houses next to the former almshouses is particularly striking with the armorial enrichment of showing the coat of arms of the Throckmorton family. Nearby, largely concealed from view is tucked away the modern building which is the Village School. Almost opposite the school are two period cottages, both of which are Listed Buildings. Sambourne Lane is marked by the former Village Forge (c1500) at the acute junction with the A435. The Forge retains its prominent horseshoe shaped doorway, a Victorian addition to a much earlier building. Continuing along the South side of the lane is the former village school, converted in 2001 but managing to retain some of the original Victorian features. Next is the delightful Victorian Chapel standing in the centre of the small graveyard. With plenty of trees, good walls and gateways in this area, this is a fascinating if rather overlooked part of the village. About half a mile further along the lane beyond the double bend (once a railway bridge), is the former Station House (1920’s) and the Waiting Room, built to serve the Evesham to Redditch Line that opened in 1866. This was closed completely on 6 July 1964. 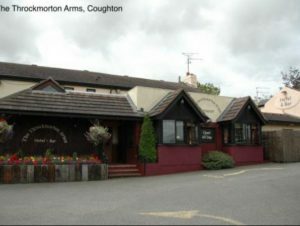 The public house at Coughton is called The Throckmorton Arms and is situated just outside the village, on the main road (A435), heading to the North. The owners are very supportive of walkers and walking groups and are happy to offer car parking facilities in either their car park or field, by arrangement. Spernall is a small village which today consists only of the Church and the Old Rectory and a few scattered farms and cottages. The small stone built Church of St. Leonard at Spernall is designated as a Grade 2 Listed Building and dates back to the 12th century, although it was rebuilt in 1844. It was declared redundant by the Church of England and has been closed since 1972. It is now maintained by the Ancient Monuments Society and is let privately as a sculptor’s studio. The simple interior is therefore no longer accessible to view, but the churchyard remains open to the public. The North door dates from 1535 and is described as a ‘work of national interest’. The western bell turret contains one bell. The Old Rectory next door is a three storey Grade 2 Listed Building and is now a private residence. Studley began as a Saxon village built around the River Arrow. There is a priest mentioned in the Doomsday Book of 1086 and this means that there was probably a wooden Saxon Church on the site of the present Norman stone Church, which was founded around 1105. From the Middle Ages the village of Studley gradually migrated to its present site around the Icknield Way, now the A435. There is no documentary evidence for why the population shifted. Theories include the Plaque or flooding from the River Arrow. In the 19th century there was still an Inn opposite the church, and a number of scattered cottages, known locally as Church End. Only the parish Church of the Nativity of the Blessed Virgin Mary and the Manor House remain. The Manor House stands on the site of the former Norman Priory (seat of the Corbucion family), and a finely carved floriated stone coffin lid from the 13th century was discovered on the site in the 1930’s and it now rests in the chancel of the Parish Church. There is car parking at the Church.